Yesterday as I was watching Olivia play I noticed something. Her little neck was bare! No fun to have a cold neck on a chilly morning. I felt what I have been feeling for a couple of weeks now: a scarf was in order. A little lightweight scarf that's just the right amount of cozy on a chilly day. With the added bonus of no frilly fringe to get in your kid's face. Because nobody wants fringe in their face. And my favorite part about it? She can't pull it off. Nor has she tried to. Not even once. This from the kid that pulls her bib off every single time she eats and won't keep a hat on to save her life? I'm totally sold. What's more, with no sewing required, it really couldn't be any easier to make. Fold your strip in half lengthwise so you have a double-thick 3" tall circle strip of t-shirt. Now twist your circle into a figure 8. ...and lay the two circles (the two halves of the figure 8) on top of each other. 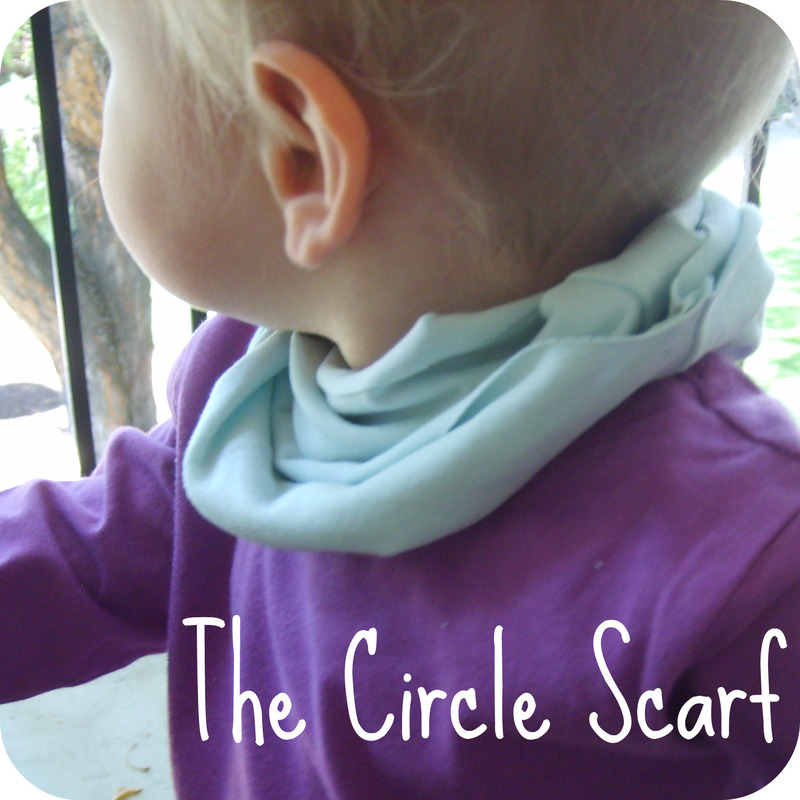 And did you notice that you finished a whole kid scarf in just four easy steps? And only one of those steps (the cutting) took longer than two seconds? Now that's my kind of project. And since you spent so little time on this little scarf, you'll have more time to watch your kiddo wear it while they play. This is and awesome idea, Katie. I'm curious to know how those raw edges hold up. I mean I know they won't unravel, but will they start to curl up? I should definitely make some of these for Becca. I need to make her more leggings too, so she can keep wearning some of her skirts and shorts now that the weather is getting cooler. Yea! for pictures of sweet Olivia! And the scarf is cute, too. Ditto to what Trish said. Love love love love the photos of Olivia, and you are one clever mama to make that little scarf for her. She looks so "in." awesome and love how quick and easy it looks! I love the pictures. She is so cute and growing up so fast. I can't believe how many teeth she has grown since we left. Give her hugs from us! Great idea Booboo! Loves!